Maria Marta Calderon is an experienced and dedicated attorney admitted to practice law in Florida and Buenos Aires, Argentina. Ms. Calderon concentrates her practice in the areas of real estate, business transactions, corporate law, estate planning and international law. Throughout her years of practice, Ms. Calderon has successfully helped her clients achieve their legal goals by developing and implementing innovative and customized strategies while maintaining a high-quality work product and personalized service. 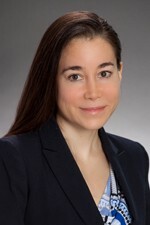 Prior to joining Hinshaw & Culbertson LLP, Ms. Calderon worked for almost four years as an associate handling all aspects of residential and commercial real estate transactions and advising foreign and domestic investors on applicable government regulations to properly structure business entities. During her practice, she gained valuable knowledge about problem avoidance under the Foreign Corrupt Practices Act and anti-money laundering statutes. This experience has been very helpful in dealing with the needs of foreign investors and foreign nationals in the United States. Ms. Calderon became a lawyer in Argentina in 2006 and practiced business and commercial transactional law there for two years. She returned to law school in the United States and received her J.D. in 2012. While in law school, Ms. Calderon earned a CALI Award for Excellence in Probate and Estate Planning.